● Easy Clean Snap-On™ patented connector easily allows changing to different cleaning tools like No-Flip Swivel Scrub Brush or DoodleFlex™ and is completely Unbreakable. ● The Snap-On connector can easily be positioned into a lock or unlock swivel mode that absorbs shocks with overload protection. Easy-Clean Snap-On Mop System: Makes Cleaning... Well, Easy! 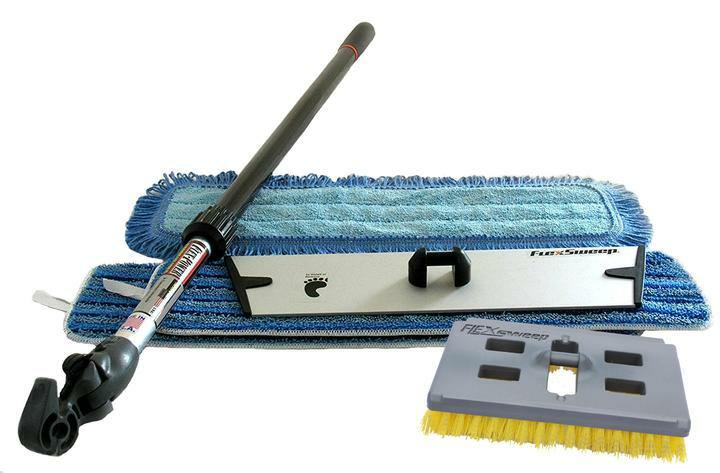 ● You only need one handle for your flat mops and scrub brushes. ● The flat mop pads are microfiber and machine washable. ● The connector locks into non-swivel mode with overload protection.